The Nintendo 64 was a revolutionary system in multiple respects. Its unique controller introduced an analogue stick to Nintendo gamers, for one thing, but the biggest revolution was in its approach to graphics. 3D was the new way to play, going beyond in-cartridge chip workarounds that had made some effects possible on the SNES - 64-bit brought the power for unique experiences. Super Mario 64 launched with the system, and it's easy to forget - or downplay - the incredible impact that it had. We'll come to that, but it's also worth highlighting that anticipation for a new core Mario game was high regardless of its approach. As this series of articles has hopefully demonstrated, the early-to-mid '90s was a period of experimentation and spin-offs, with a notable gap from Super Mario World to the next core Mario platformer. The alternative titles such as Super Mario World 2: Yoshi's Island were excellent, but Nintendo's mascot was due a fresh adventure. Of course, the SNES era had been largely 2D as per the technological limitations, with some titles utilising SuperFX to push the hardware further. It was that cartridge technology that apparently drove forward the first prototypes for a 3D Mario title, though Nintendo surely realised early on that the idea wouldn't fly. Shigeru Miyamoto, of course the figurehead of attempts to push new ideas, was nevertheless eager to pursue Nintendo games created in 3D worlds. The Nintendo 64 made that possible, with a technological leap that was - back in 1996 - hugely impressive. Console gamers had largely been accustomed to pixel-based visuals - though there had been exceptions - yet the N64 put polygons at the core of its look. When Super Mario 64 launched with this new hardware it did, with little exaggeration, change the face of gaming. From the opening screen in which you could manipulate Mario's face to the beginning of the game outside Peach's castle, it was immediately clear that this title would herald a new era in platforming. With a free camera and fluid movement, Mario could long jump, climb trees, punch and more in fully 3D stages. In 2015 that's all simple and standard fare, but 19 years ago it was a mind-blowing experience. Unlike previous titles, too, there was an element of freedom to progression, with level design encouraging exploration and puzzle solving. With multiple stars and tasks per level, on occasion figuring out what to do would require some thought as well as skill, all in a quest to unlock more areas of the castle. That sense of freedom, combined with control inputs and moves that were brand new at the time, made this a memorable and intoxicating game to play. This is a game that's also held up well to the modern day, which is impressive in the context of its trailblazing approach. Fluid animation and some classic, memorable stages also team up with significant degrees of challenge late on. Some of the N64 library has aged badly, yet this industry-changing launch release has done so gracefully. Of course, the impact of Super Mario 64 on the broader gaming medium is difficult to over-state. It established the potential of 3D environments and gaming, which would not only inform future Nintendo games but also provide the building blocks for many others. It proved what was possible, and also how a dynamic camera can enhance gameplay. Super Mario 64 is not only one of the greatest video games of all time, but also one of the most influential. Naturally, it's much loved by speedrun experts, too - below is a great run from Summer Games Done Quick. Back in the days, it was great. I mean, after playing 2D stuff and then jumping to 3D was a great experience. Nowadays, IMO, SM64 has lost its greatness: the level design lost its charm(Almost all levels are restricted to be a box), with superior platformer games released (BK, etc.). Super Mario 64 is the second best 3d platform adventure game in my opinion. Second only to Super Mario Sunshine. And this is coming from a guy who's very first video game was Super Mario 64. It will always be one of my favourites. Great piece for a great game. I remember working as a kid to save up for a Nintendo 64 and this game at launch. It truly was groundbreaking in many ways, fluid 3D gameplay, 360 degree movement with the joystick, and excellent level design. I enjoyed the past Mario games but when this released it showed what the future would hold for 3D gaming. @NintyMan Great levels you mentioned. For me I would also add the first Bowser boss stage. The obstacles and design is very memorable for me. Not my favorite Mario game. Action platforming was replace by puzzles and star-hunting losing many of its charm , although still entertaining. SM64 one of the best. I think the galaxy games was the pinicle of the 3d Mario games control wise. I still pull out the N64 to play Mario 64 and Doom 64 and my favorite 007. @Minotaurgamer same here. I think it was in best buy. Lots of kids were just staring watching one play around the castle. Great memory. 3D Mario needs another Super Mario 64. I want my playground-like worlds back. My interesting hub worlds. It just seems that, starting with Wii and DS, both 3D and 2D Mario got somewhat less... inspired. Which might be why people are excited for Super Mario Maker; it actually looks inspired, AND let's you use your own inspiration. Not my favorite 3D Mario, but still, I can only hope to imagine just how amazed everyone was at seeing Mario in full-fledged 3, though I can get a pretty good idea based on people's comments. I'm playing through all the core Mario games and I just got 120 stars in this the other day. It's a great game still but it definitely is surpassed by its successors in Sunshine and the Galaxy games. Still, when this game debuted it was a perfect example of how to transition a series to 3D. Both Mario and Zelda both had successful 2D => 3D transformations. I absolutely love adventure games. They pull me in so much more than just action platformers, which is why I love open mario adventures much more than linear mario platformers. My top 5 favourite games are all sub-genres of the adventure game and Mario 64 / Mario Sunshine are in there for sure. I always said that Super Mario 64 was the greatest video game of all time until I recently took off my nostalgia goggles. However, there will still always be a shining star in my heart for Super Mario 64. If I try to be unbiased, I can still say it is one of the best and most influential games ever made. SM64 gave the world much. Anyone disputing its achievements is too far removed from the year 1996 where a bit-sized video game icon made a move into 3D with a gracefulness that few pixel platformers would replicate after the way was lit. Super Mario Bros is also like this for me, I can play 2, 3, world etc today but not the first one. Kinda wished they would bring the paintings back in a Mario game, it was fun looking through the castle and finding paintings that were actually levels. After this gaming was changed forever, a master class in how to make 3D games. I saw this running in a games shop and started running myself, home to get my Playstation to trade it in for an N64! Mario64 is still great and I play from time to time. I remember being blown away the first time I played the game... in 2004 no less! 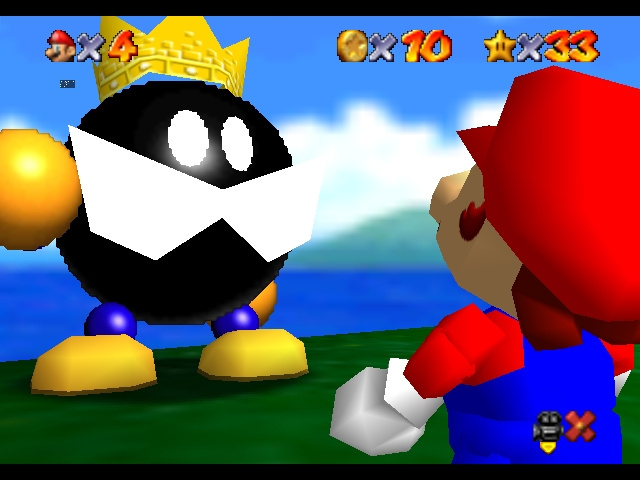 I still feel that Mario himself has never been better represented in a 3D game than he was in Super Mario 64. He's never had a more extensive, fluid, complete moveset. The variety of flips, jumps, and other moves he has in SM64 has never been matched in any of his subsequent games. 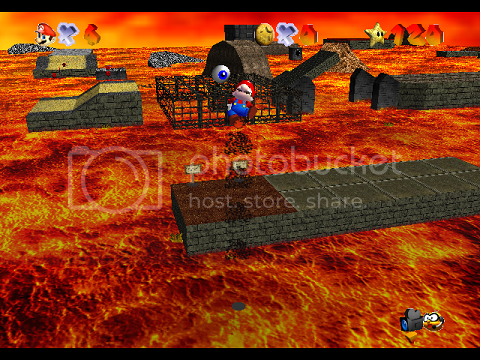 Things like the waterpack from Sunshine and the spin from Galaxy were great and served their purposes well within their own games, but in terms of feeling in complete control of Mario himself, it doesn't get better than SM64. Plus, it's the only 3D game where he can punch and kick! Removing those abilities in Sunshine was my biggest complaint about that title. The overall game was magical, too. Such lovely worlds to explore, and it all really felt open instead of linear. Sunshine had terrific levels, but it didn't have the same feeling of "anything could be coming next", and Galaxy was quite linear. Finally, I will admit that watching the ending credits of SM64 was probably the first gaming moment that deeply, truly moved me. There's something about the beautiful music that plays, combined with the look back at all the worlds you'd explored and characters you'd met... it really felt like the perfect retrospect of a long, meaningful journey. I began Super Mario 64 as a ~7 year old gaming novice who cried because I couldn't manage to get enough stars to unlock the first winter world in order to show my dad the huge penguin who lived there. @DualWielding Interesting. I wonder, was it because this is a 3D platformer? @apowes I don't know. I felt Sunshine and to some extent, galaxy to control the same way as in SM64, with the exception of the tweaked game physics and the punching and kicking. I still wonder why this still gets a 10/10 in some reviewers. Its true this game had a big key in gaming history, but no way nowadays this game is 10/10. I suppose nostalgia has a pretty big part on this. This is why I always think people make this an overrated game. But yeah, the enjoyment factor is there. Well, I think it has aged pretty well. Wow! I'm really surprised at the amount of people that don't like this game. As I thought I was the only one. For some reason I love the Mario platformers, 1-3 and my favorite Mario, Super Mario World... But I don't know what it is, but ever since Mario made the transition in to 3D space I've never felt comfortable controlling him. My guess is that ever since the early Mario games everything was relied on timing of the jumps and what not and now they aren't there, it just feels off for me. Maybe one day i'll revisit them and try to enjoy them but I doubt it. I can't believe my first Mario game is almost 20yrs old. In 1997 Daniel was an innocent, unharmed by life Brazilian who wanted just one thing in the world: a N64. He even prayed to God to give him one. I'll never forget the October 12 (Brazilian Children Day, therefore bank holiday), when my dad gave me one and my little brother and I bopted it up. I can still hear in my mind the staff roll song. Truly a gaming revolution (it blew my mind when I first saw it, and played it), but I still think all the best 2D Mario games are better than it and indeed better than any of the best 3D Mario games. Ah, Mario 64. I was so astonished in 1996. I played hours just in the front of the castle before entering it. It was so great to move in three dimensions. But I did not personally own an N64 and so my first own 3D Mario was Mario Sunshine. I loved it but I missed the freedom of SM64 from the beginning. The levels were great but too linear. 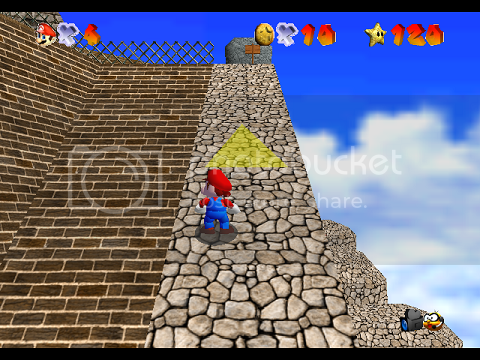 In Mario 64 you could collect the stars in your own order and sometimes stumble on one of them. In Sunshine you almost always have to collect the star you have chosen in the level screen. 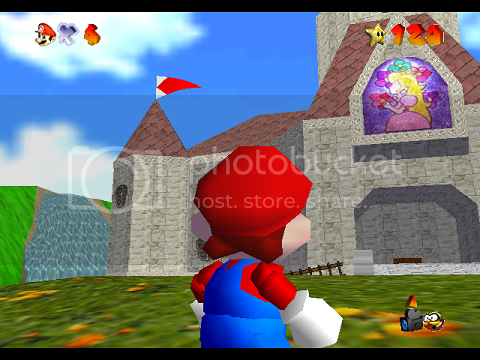 The freedom of Mario 64 is what I really miss in Mario games these days. No time limit, no playing order, no level order, almost no obligatory levels and many ways to get the star. @gaming_24_7 I totally agree with you. As nice as Super Mario Galaxy games are, they really lack that sense of freedom and exploration. I really hope next 3D Mario game is like Super Mario 64 and Sunshine and not like Super Mario Galaxy/3D World. SUPER MARIO 64 is an epic masterpiece that reinvented 3D gaming forever. It's overarching influence on all 3D games is still witnessed to this very day. @Gridatttack Personal opinion plays alot here. Banjo Kazooie is undoubtedly superior on a technical level and alot of fun, but Super Mario 64 is still the best 3D platformer ever. It's world's are abstract and magical, full of awe and inspired design. Super Mario 64 wrote the blueprints for all platformers. @AbsolutSnake The Mario 3D games are all about timing and jumping. Alot of people like yourself do have naturally poor spacial awareness and motion sickness so it is inevitable that you will not like them. For some reason this one just didn't stick with me as much as Galaxy. It probably would have if I had played it when it first came out and 3D platformers were still new, but I didn't own an N64 back then. Still much more fun than Sunshine, though. @allav866 I'm so glad I'm not the only one who was scared of that fish. I got eaten by it the second or third time I visited the level and spent almost six years downright refusing to play that level again. It took me less time to grow the balls to confront the Final Boss again. It's-a me! The best game ever made! Ah, the nostalgias. It's still my favorite game, not because it was the first of its kind, but because it was a collect-a-thon Mario platformer that didn't need to tack on any extra features or outlandish themes like later 3D Mario platformers. When the next 3D Mario game comes out, I just want it be a collectathon that goes back to the simplicity of Mario 64, just enhanced with the capabilities of modern hardware. If you think Bob-Omb Battlefield in 1996 was a sandbox, boy, imagine what a sandbox Mario level would be like in 2015! This game will always hold a magical place in my heart. I was 11 when it released and the level of excitement these controls, graphics, and level design created cannot be overstated. This was a great Mario title, and definitely got you used to the N64 controller. The only issues I had with this game was some of the controls. If you wanted him to back jump, sometimes he wouldn't. Other issues were going into a corner and having just an orange screen to where you didn't know where to go. The only other problems (which also came with Donkey Kong 64) was the constant moving camera. I loved jumping into the cannon, and the camera was moving so much. Other than those problems, this was a great game with a good replay value and difficult level to it. The Icarius hat was incredibly hard to get used to...using that was the only stars I never got, besides killing myself numerous times on the slide levels due to not being able to control him too well and the camera moving on me too much. I just started playing this one last week (not even for the 30th anniversary...my roommate downloaded it because Club Nintendo and it sat there forever). I wasn't that impressed at first, but now I think I'm kind of addicted! Chasing the stars is very fun, even if the game feels kind of unfair at times (oh camera, why do you make Mario disappear when the jumps get tough?). It luckily hasn't gotten so frustrating that I've quit, which to me is the sign of a good game. Also Galaxy was my first real experience with 3D Mario, so I've sort of played these games backwards, and it's funny to go back to Galaxy. I like the hub world in this better, but Galaxy feels so much easier now because Mario's boots seem to be made of ice in this one sometimes (except for the Luigi parts, but we don't speak of that)! I didn't own an N64, so my first experience with this game was the DS remake when I first got my DS. I eventually got it on Wii Virtual Console, and although I enjoy the game alot, I will admit it is dated in a few ways, mostly the camera. Still, there's no doubt Super Mario 64 was great in it's time, and one of the premier titles of the 90's. Super Mario 64 - one of my all time favorite games and my all-time favorite Mario game. A true masterpiece in my opinion. No game better showcased the power of its own console. I would argue that Super Mario 64 was just as influential as the original Super Mario Bros - if not moreso. Most, if not all, modern day games owe something to the genius that is SM64. The gameplay holds up extremely well today, the graphics maybe not as much, but who cares? NES games' graphics don't hold up either. I think the majority of the people who dislike SM64 or don't appreciate it are those who never grew up with it, or if they did then all they care about is graphics. The N64 constantly seems to be referred to as an outdated console that didn't age well but I think that's completely blasphemy. The N64 is as timeless as any other retro console. It had so many fantastic games that really pushed the hardware and showcased what the system could do. Super Mario 64 in particular is just the crown jewel of the system and we just got lucky that it was the first game that came out for it. We didn't have to wait at all to get the best that system had to offer. @liveswired Calling it the Best platformer ever is a little farfetched. But whatever, its your opinion. But I do wholly agree that SM64 serves as the basis/blueprints of most, if not all, 3D platformers. Best game ever surely. I remember when this launched the staff at hmv had to drag me out of the store at closing time every evening, I just couldn't stop playing! Super Mario 64 was an amazing game for its time. This game hasn't aged too well, but I think it can still be enjoyable to play. The music is great, but the camera isn't good, though. I do prefer Sunshine and the Galaxy games over SM64, though, but I still think its worth playing if you haven't already. SM64 DS is good to play as well. @Gridatttack Agreed. It was good when it came out, but later games like Spyro the dragon, Banjo kazooie, Rachet & clank and Jak & daxter as well as later 3D mario games refined the genre. @DarthNocturnal Excuse me? Galaxy was not inspired? @PigmaskFan are those beta versions of the game? Anyways, even though the later 3D games are technically better than this one, I still say that this is my all time favorite game period alongside World. That being said, I just wonder....how is it that no one complained about the different power-ups that this game has and that the 2D games have? Like why at the time, not having a Mushroom but instead a health bar was decided? I wonder how that big change managed to appeal all the fans. Also, I don't get the hate for the camera. It was the first to do something with the camera than just following you which itself is an accomplishment. "Super Mario 64" debuted when I was a junior-high school student, and I recall being excited about it back then...but not obsessive like I was with "Ocarina of Time". I like the first 3D "Mario" game, but some stages still frustrate me a ton. I still end up smoking (figuratively) when attempting the Clock Tower, or spinning Bowser around on all three meetings.